The weather has changed so much since Spring has started and this is the time when my allergies really act up. My skin starts to get dry and itchy and extremely flaky. I've never been shy about letting you guys know that one of my favorite skin care companies of all time is Mio. When I was pregnant their stretch mark cream saved my live. I really do credit that company for my flawless mid section after having two children. I slathered that stuff on like crazy and I don't have one tiny mark to be seen on my tummy. Mio has came out with a Double Buff dual action Exfoliator for your body. ($33) It will turn dry icky skin into soft heavenly smoothness. I really didn't realize how important it is to exfoliate your ENTIRE BODY until I tried this out. So how do you use it? That was my biggest question when I saw this product. You strip down your clothes, take a big glop of the exfoliator and put it everywhere all over your body. I tried not to use TOO much because I don't want to waste it, but once I felt it was all over I scrubbed it into my body so the beads really exfoliated my skin. I hopped in the shower and scrubbed off the soap and when I was done in the shower all I felt was smooth soft skin. At first I was scared to try this on my face but after reading the instructions I found out it was ok. My skin has never felt softer and I love how my makeup looks much more "soft". 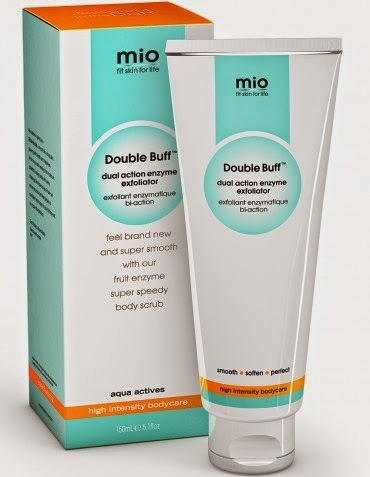 You can purchase the Double Buff Dual Enzyme Exfoliator at Mama Mio's Website for $33. Disclosure: A press sample was sent for consideration for the purpose of this review. All opinions are my own. No monetary compensation was received.